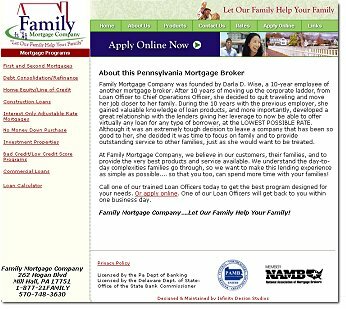 Family Mortgage Company was founded by Darla D. Wise, a 10-year employee of another mortgage broker. After 10 years of moving up the corporate ladder, from Loan Officer to Chief Operations Officer, she decided to quit traveling and move her job closer to her family. During the 10 years with the previous employer, she gained valuable knowledge of loan products, and more importantly, developed a great relationship with the lenders giving her leverage to now be able to offer virtually any loan for any type of borrower, at the LOWEST POSSIBLE RATE. Although it was an extremely tough decision to leave a company that has been so good to her, she decided it was time to focus on family and to provide outstanding service to other families, just as she would want to be treated.